The front inducer, because the inducer has much higher cavitation resistance than the centrifugal impeller, so in some pumps with high cavitation performance requirements, the front inducer is widely used (ie, an inducer device is installed in front of the first stage impeller). 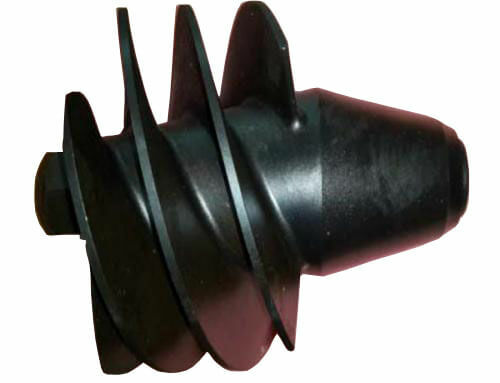 Why does the inducer have much higher cavitation resistance than the centrifugal impeller? This is because in the centrifugal impeller, when the liquid enters the blade head, the direction should be sharply turned, the flow rate is increased, so the pressure is reduced, which is extremely It is prone to cavitation and separates the vapor from the liquid. 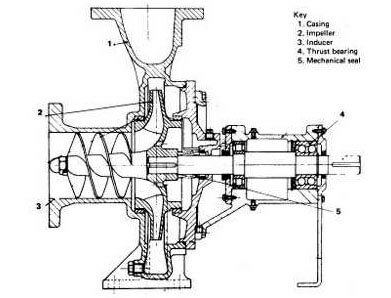 After the initial cavitation is generated, the centrifugal impeller cannot limit its development because the flow direction of the liquid in the impeller is along the direction of the centrifugal force, and the liquid is under the action of centrifugal force. The high speed outwards, which accelerates the separation of the vapor and the liquid. However, in the inducer, this is not the case. First, the liquid does not go through the turn when entering the inducer, and the dynamic pressure drop is small, so that cavitation is less likely to occur; that is, cavitation occurs (mainly occurs at the outer edge of the inlet, because here The relative velocity is the largest), the bubble will be immediately attacked by two aspects: on the one hand, when the outer edge bubble flows to the high pressure region in the axial direction, the pressure is immediately condensed; on the other hand, under the action of the centrifugal force, the hub The liquid rushes toward the outer edge of the inducer, which also causes the bubble to condense under pressure. The cascade density L/t is large. When the inducer works together with the centrifugal pump impeller, the lift generated by the inducer wheel pressurizes the centrifugal impeller. The inducer blade type has two types of flat type and curved type. The flat blade type has the same angle of the blade at inlet and outlet, and is also called the Equal pitch inducer. The inducer with a curved blade has a small angle of the blade at inlet and a large angle at outlet, that is, β1<β2, which is called an increased pitch inducer. The first flate type of inducer is often seen in cylindrical inducer, and the second curved type is often seen in tapered inducer. Compared the cylindrical inducer with the tapered inducer, the cylindrical inducer is better, the tapered inducer with higher efficiency , better cavitation resistance (because of the large outlet angle, and has a tapered shape, which is conducive to re-condensation of the bubble), and the stable operation without noise. The hub and rim shape is cylindrical or 15° tapper. In the power plant, the inducer is mostly used in the newly buit condensate pump. due to adopt inducer, the pump can increase speed, so that can reduce impeller Diameter and stages of the pump under the same flow rate and head. to make The condensate pump structure is simplified and in smaller size.